Saint John came from Bethsaida, a poor village in Galilee. He was the son of Zebedee the fisherman and of Salome, the daughter of Joseph, the Betrothed of the Virgin Mary. Joseph had four sons by his first marriage: James, Joses, Jude, and Simon (or Simeon), and three daughters: Esther, Martha, and Salome. Thus, Jesus Christ our Savior was the uncle of Saint John the Theologian, since He was the half-brother of John’s mother Salome. John and his brother James were helping their father Zebedee with the fishing when the Savior called them to follow Him and become fishers of men. They immediately left everything to follow His heavenly teaching. Such was John’s love of virginity and ascesis that, above all the disciples, he was worthy of the name of “virgin,” and such his ardent love for Christ and irreproachable life that, among them all, he became the “beloved disciple.” He was one of the three closest to the Savior, who ascended Mount Tabor with Him. John looked upon the Divinity shining in the body of Christ and heard the voice out of the cloud that said: “This is my beloved Son in whom I am well pleased; listen to Him” (Matthew 17:5). It was John, carried away by his love, who wanted to sit at the right hand of the Lord in His Kingdom (Matthew 20:21). At the Last Supper, the Lord placed him at His side, where he leaned on the breast of his beloved Master (John 13:23). When the Jews laid hold of Jesus, Saint John followed Him into the palace of the high priest (John 18:15). He alone remained with the Virgin Mary at the foot of the Cross when the Savior was crucified. Seeing John standing by, Christ said to His mother: “Woman, behold your son!” and to John: “Behold your mother!” From that hour, John took the Virgin Mary into his own home (John 19:27). At the time the Resurrection was announced, John outran Peter and came first to the Tomb. It was he who first stooped down and saw the linen cloths lying on the ground (John 20:5-6). He saw Christ after His Resurrection and was commissioned with the other disciples to preach the Gospel throughout the world when the Lord breathed on them as an earnest of the gift of the Holy Spirit (John 20:22). He was present also at the Lord’s Ascension into heaven and received the Holy Spirit under the appearance of tongues of fire with the other disciples on the day of Pentecost (Acts 1-2). He remained the last of them all in Jerusalem, in the company of the Virgin Mary, whom he served until the time of her Dormition. When the time came to part from one another to preach in all the regions of the world, the Apostles drew lots to tell where each should go. It fell to John to preach the Gospel in Asia Minor which was full of idolatry and entirely given over to paganism. Saint John was much cast down on learning where he was to go for he had not yet learned to put all his trust in the invincible power of God. To purge him of this human weakness, God put him to the trial of wind and waves for forty days before he reached his destination. During this tempest, John’s disciple, the deacon Prochorus (July 28), was cast by the waves upon the shore at Seleucia where the people of the city accused him of witchcraft, suspecting him of having spirited away money from the shipwrecked vessel. He manged to escape, and after forty days found his master whom the sea had brought to shore at Marmareota, another city of Asia Minor. They made their way to Ephesus, a place where the people had great devotion to the goddess Diana and would celebrate festivals in her honor. At one of these, John climbed the hill where stood the great statue of the goddess in order to address the crowd. The pagans were enraged to see him there and tried to stone him, but by the grace of God all the stones missed their mark and struck the statue, which was reduced to rubble. But the pagans, blind to the signs of divine Providence and deaf to the words of Saint John, made a second attempt to stone him. This time the stones turned back on the idolaters themselves, and the earth, quaking at the Apostle’s prayer, suddenly swallowed up more than two hundred of them. The people who survived came to their senses at last. They begged John to intercede with God to deal mercifully with them and restore to life those who had perished. So, at the prayer of Saint John, all those people came forth from the bowels of the earth, venerated the Apostle and were baptized. The Emperor Domitian (AD 81-96) heard of John’s renown and arranged to meet him. He was so enraged by the Apostle’s confidence that Christ is mightier than any worldly power that he banished him to the island of Patmos in the hope of reducing his influence. On the voyage there with Prochorus, John showed the kindness of God towards man by curing the dysentery of the soldiers escorting them. As soon as they arrived, he freed Apollonides, the son of Myron a local dignitary, of an impure spirit. This miracle, accompanied by the word of John, brought Myron’s entire household to faith in Christ and baptism; and a little later, the Governor of the island was also baptized. 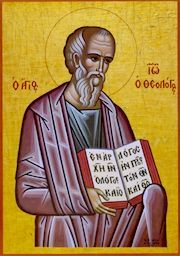 While he was on Patmos, John received a letter from the Bishop of Athens, Dionysius the Areopagite (October 3) who was then ninety-nine years old. He praised John as the daystar of the Gospel and prophesied that he would soon be freed. Indeed when Trajan succeeded Nerva (AD 98), he recalled Saint John to Ephesus, to the great sorrow of the people of Patmos whom he had converted. John did not want to leave them unconsoled. Strengthened by a sign from heaven, he fasted with them for three days; then, accompanied by Prochorus, he went up into a mountain where he directed all the powers of his soul towards the Lord. Suddenly the sky was rent by fearful flashes of lightening and claps of thunder. Prochorus was overwhelmed and fell to the ground while John remained impassible in contemplation. He heard a voice like thunder proclaiming from the height of heaven: “In the beginning was the Word, and the Word was with God, and the Word was God” (John 1:1). Prochorus transcribed this message of salvation, revealed to John as was once the Law to Moses on Mount Sinai, but this time not for the Jews alone, but for all even to the ends of the earth. It was also on Patmos that John wrote the New Testament book known as the Apocalypse or Revelation. John saw Christ, having the appearance of a young man whose “face was like the sun shining in full strength.” Reassuring John, who “fell at his feet as though dead,” the Lord said: “Fear not; I am the First and the Last; I am He that Lives and was dead; and behold, I am alive forevermore and have the keys of Death and of Hell. Write the things that you have seen, and the things which are, and the things which shall be hereafter” (Revelation 1:17ff). Then in successive revelations John was shown what will happen at the end of time: the gathering strength of iniquity, the coming of the Antichrist, his warfare against the faithful and his final struggle against Christ who, in the end, will cast him forever into Hell with the Devil and his angels. It was also given him to see in his vision the violent upheavals that will take place in the world, the fiery end of all things, and the final triumph of the Son of man, the general Resurrection and the Last Judgment. After his time on the island of Patmos, the Apostle John returned to Ephesus where he spent the remainder of his days in peace, bringing many to the faith. He was fifty-six when he left Jerusalem to preach the Gospel, which he did for nine years until his exile. He spent fifteen years on Patmos and lived another twenty-six years after his return to Ephesus.